Been so busy with all of the drawing stuff that I’d clean forgotten to get back up to speed with the story of the 250 build, sorry. Actually it’s about time I started getting to the end of this otherwise it’s going to turn into the longest quick build in history. So where were we? 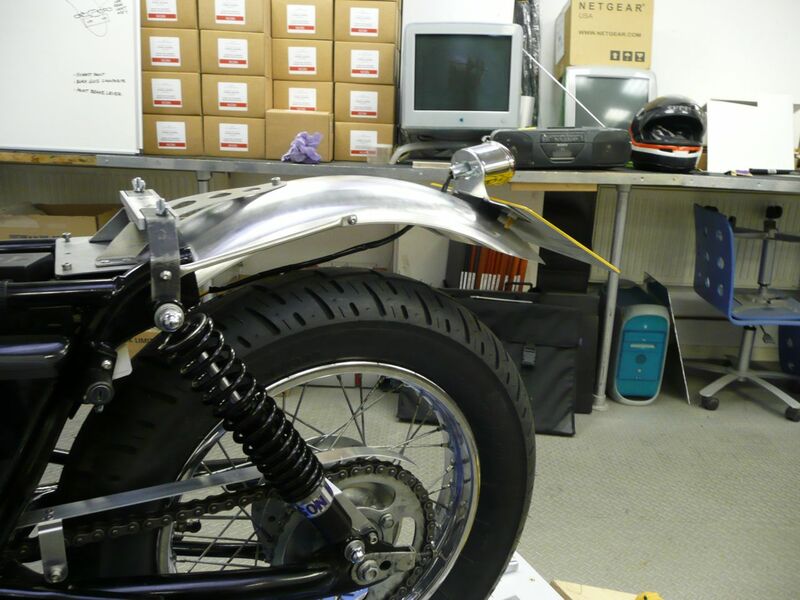 With the metalwork completed for holding the rear fender and the rear of the seat in place it was time to cut it down to its final length. and attach the rear lamps. I’d decided on a rounded end to the fender and made up a thin card shape template using a combination of large radii. The line was drawn on the fender with a Sharpie and then cut round carefully using a jigsaw, much noise and dangerous looking manoeuvres. I finished it off carefully with a metal file and some wet and dry paper wrapped around a block for a smooth finish ready for painting. 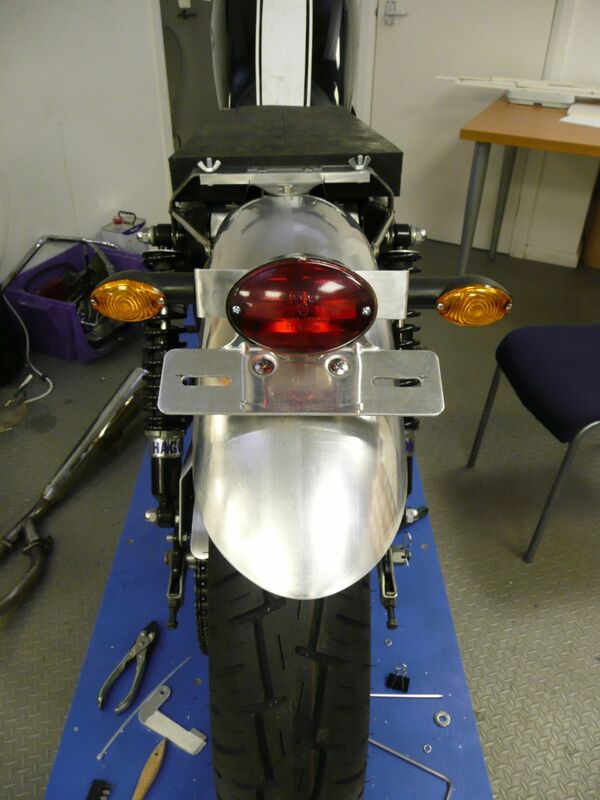 I’d made up the rear lamp assembly in accordance with my build philosophy, this was to be a workhorse bike. So I wanted easy removal of the whole lot if needed, tidy wiring and if the registration plate was integral all the better. I knew I couldn’t have the plate mounted on the side of the bike to keep the back end clean as this would have been asking for trouble in the parking bays of London, so on the rear fender it had to go. I’d cut and bent a short length of flat aluminium, drilled appropriate holes and created an assembly which could be mounted and removed as one piece. 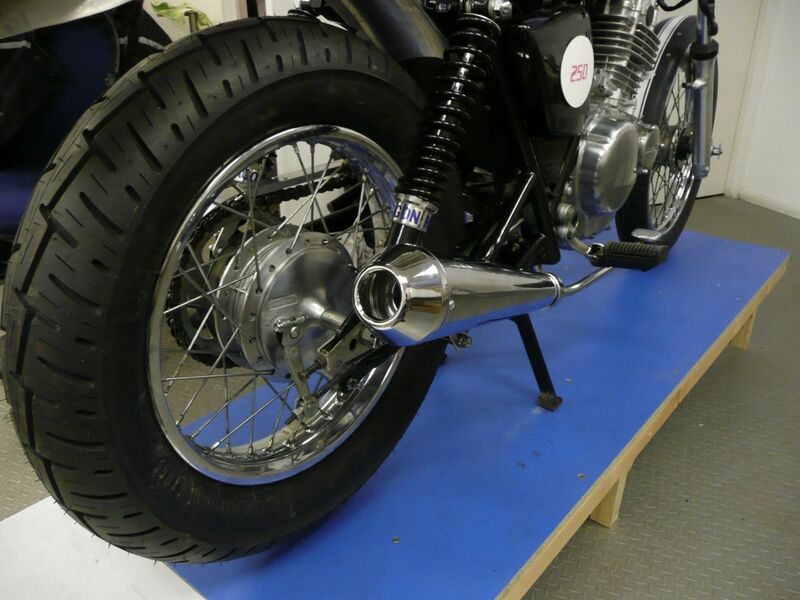 When attaching the light assembly I didn’t want to distort the aluminium of the fender by bolting the flat mounting directly to the top of it. So I needed to make a block of something to cope with the curvature of the top surface. I tried a whole host of solutions from solid plastic blocks to bits of bent metal strip but nothing worked well enough. Time for a think. In the end I settled on cutting and shaping a large lump of quite firm neoprene foam to sandwich between the lamp cluster and the fender. I figured it would compress into the correct shape, which it did admirably, and that it would provide a degree of vibration damping for the lamp bulbs. Whether it would or not I’ve never really proved but it looked good enough for my purposes so I went with it. I’d also received by now the exhaust muffler I’d ordered and bolted this to the back of the bike to start the process of working out how to attach it to the engine. 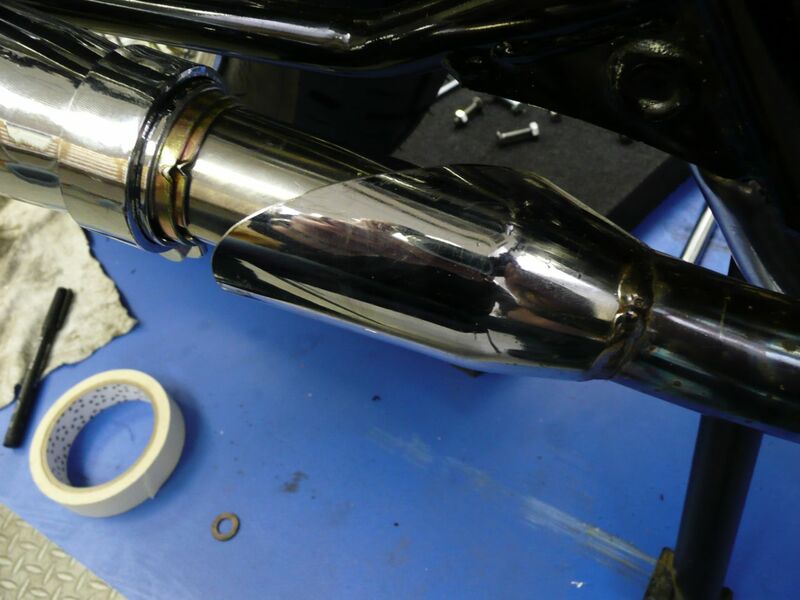 I’d decided, for budgetary reasons primarily, but also because of time to use the existing header pipes and junction but, I had no idea where to make the cut to remove the enormous and heavy standard muffler. Reckoning that the pipe would pass into the muffler for a short length I reached for the angle grinder and cut through the muffler at its root. Low and behold there was a length of exhaust passing right up into the offending muffler. 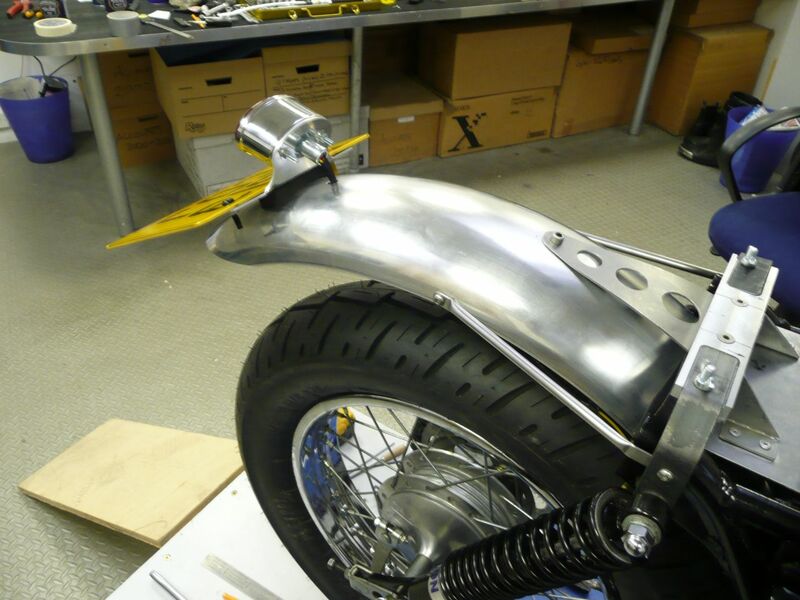 I measured the diameter and was happy that I could attach the new muffler to it and tidied up the cut by taking a slice at an angle creating a kind of heat shield detail. So the pipe went on very quickly much to my relief. But it was loud, so I knew i’d have to do some baffling if it was to stand any chance of getting through the MOT test. This entry was posted in Uncategorized by Soulcraftcandyman. Bookmark the permalink.